Last weekend in Gig Harbor, a Pierce County Sheriff’s deputy shot and killed his in-laws, held his own children hostage, and then committed suicide. I was shocked; then I wasn’t. The media didn’t name the victims right away and I wanted to know who they were. The murder-suicide happened right behind my old middle school. I grew up in that area. Like the Brame murder-suicide in Gig Harbor in 2003, in which the Tacoma police chief shot and killed his wife and then himself, this hit way too close to home. In more ways than one. I didn’t want to blog about this until the investigating agency released the motive. The motive seemed predictable, but that’s probably because I’ve experienced domestic violence by cop. More than once. Today the Tacoma News Tribune said that Deputy Allen Myron killed his mother-in-law and father-in-law because he believed they had “turned his wife against him.” There it is. Power and control. Shifting the blame. Myron shot his father-in-law in the driveway, dragged his body into the garage, and then hosed the driveway down before shooting his mother-in-law. She managed to escape from the house and get help before dying at the hospital. Myron’s daughter and a family friend were told to go downstairs, but it sounds like they were aware of what was going on. News reports say the friend tried to talk sense into Myron, but after conversing with the police for awhile, he committed suicide. Myron’s wife had just gone to his commander about his behavior the day before. As in nearly every other shooting spree or domestic violence homicide, there were possible red flags ahead of time to indicate that something was wrong. There may have been emotional abuse. Problems in the marriage. Depression. A long-term medical leave and persistent physical pain. Yet it’s hard to believe, when you’re part of that family, or friends with the troubled person, that they are capable of homicidal rage. Inevitably, people will remember a “devoted family man” and a “nice guy”, and he may well have been that part of the time. But now we know there was another part of him as well, the part that felt like he was losing control. I know this man’s family loved him, and I don’t want to judge things I don’t know. But I do know that power and control is almost always the basis of abuse, and it can be complicated by mental illness and addiction. Domestic abuse affects an estimated 40 percent of law enforcement and military families, a higher percentage than the rest of the population. If this man felt that his in-laws or someone else were “robbing” him of control over himself or his family, then he may have felt that he had to punish them for it. It is important to remember that the risk of homicide goes up 75 percent when you leave an abusive relationship. Some people just can’t stand losing control—they don’t want you, but they want the final say. Before I continue, I want to say that some of the best and worst people I’ve ever known work in law enforcement. There are a lot of cops who selflessly risk their lives all the time for the greater good. I am eternally grateful for the police department that stood by me when I had to stand up to death threats and abuse by my police officer spouse. Some of my best friends work in law enforcement. I have family in law enforcement, and I’m a fourth generation civil servant. My family has law enforcement associations going back to the 14th century. I will be the first person on your case—like a bad rash—if you malign the good cops I know. But there are psychologically ill and abusive people in the profession who take their problems out on their families. They project blame onto others, they can’t leave their authority and badge at work, they accuse everyone else of perpetuating problems that only they can control. My life has been profoundly affected by such people, as well as the actions of the police department I worked for that led to my being harassed out of my job and long-term unemployment. So desperate was one supervisor to cover their actions that they committed perjury in an unemployment hearing. I never got unemployment benefits even in spite of a concurrent disability issue. I believe this person used my domestic violence situation to undermine my credibility so I wouldn’t be believed if I reported them for a suspected wrongdoing. Who would believe the “problem employee” who was already accused of lying about domestic violence to “get attention”? I have been so deeply disturbed by the incidences of certain behavior patterns and mental issues I’ve seen in some law enforcement employees that I earned my criminal justice degree and am working on my master’s to address those issues. The current hiring and screening procedures that police departments use to weed out undesirables can be beaten by psychopaths and other cunning personalities. On top of that, there is such a strong sense of brotherhood within law enforcement that some people will do just about anything to protect a coworker accused of a crime. Many police officers have such powerful bonds because they have to protect each other’s lives. They have to know that the next guy’s always got their back. That can become a problem when the next guy does something wrong. Additionally, I feel very strongly that police employees and their families are not provided with appropriate crisis and stress management resources. So not only do some deviant people gravitate towards the profession, but decent people can be damaged by its macho, show-no-weakness culture once in it. Their families are frequently forgotten about when the employee needs treatment. Families would also benefit if each shift concluded with a debriefing similar to the briefing that starts officers’ days. 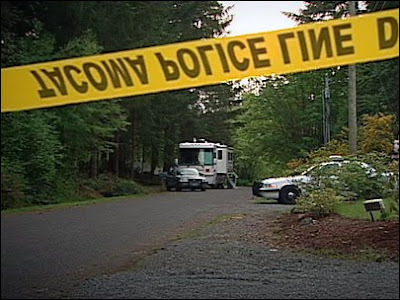 In the wake of the Brame murder-suicide in Tacoma in 2003, many police departments instituted domestic violence policies, supposedly to protect victims of police officer abusers. Networking with other survivors of cop domestic violence, as well as my interactions with lawmakers, has shown me that these policies are largely ineffective. The department I used to work for put such a policy in place a month after my abuser was arrested, but it did not apply to me because the perpetrator worked for a different department. I have heard far worse stories than mine from women who’ve stood up to domestic abuse in law enforcement, but I can attest to the mismanagement of such cases by police departments too. When I joined the state’s Address Confidentiality Program, my supervisors tried to publish my actual home address in the department directory anyway. They illegally coerced me into giving them that address in a sealed envelope, which was always hanging over my head when I tried to fight back against mistreatment. When I asked to park in the police department’s underground parking garage, my request was ignored. The county prosecutor’s office asked the chief’s office for me, and I got an email from my boss suggesting that I park at a new lot a quarter mile away—in the dark of winter. I already parked off-campus and because of working different hours than my coworkers, walked to and from my car alone. My then-spouse had threatened to kill me with his “sniper rifle” while I was in my car at work. I was not allowed to tell my police officer coworkers that I had a protection order, anti-harassment order, and restraining order against my abuser, meaning that he might not have been questioned if he showed up at my workplace. When he “sold” his personal firearms to a lifelong friend and next door neighbor to spring them from safekeeping, I had to go over the police department’s head to get the mayor’s backing to tell my coworkers what was going on. That was for their protection as well as my own—and even then, the department wouldn’t do it. I wasn’t allowed to do it. The union did. What my coworkers knew about my situation was tightly controlled, and while most of my coworkers seemed neutral about my situation, the harassment and bullying from certain people never stopped. One lieutenant allegedly told their squad to ignore the allegations against my ex because I was making them up for attention. The department did nothing. My supervisor later told me that “we didn’t want to be sued for libel and slander for telling people about the arrest and court orders”—even though the perpetrator had agreed to attend two years of alcoholism and batterer’s treatment to get the charges dropped. In my exit interview, at a time when I had just lost a family member and needed a medical leave but decided to get out instead, I tried to report everything that had happened to me on the job– again. To date I had been told I was an extremist, that I was outspoken, that I was treating a supervisor poorly, asked if I were going to become a “man hater”, and reminded several times that no one wanted to get involved in a “personality conflict” between me and a supervisor. There were different standards for me, and the rules surrounding my duties were subject to change. I was under intense scrutiny. I was talked to as if I were a troublemaker who was harassing others. I was treated like a liar, and routine requests for time off were treated as suspicious. Personal information was shared with people I didn’t tell. I was pushed out of certain projects and committees, and credit was unfairly taken for work I did. My passion for helping crime victims was ridiculed as me promoting my own vendettas and personal agenda. There were two incidents in which I almost called 911 from my desk (which was answered in the same building). It was, by legal definition, a hostile work environment. Returning to the above-mentioned exit interview, the HR director looked at me and said, in the presence of a witness, “We hope you never work in law enforcement again. It’s a poor fit for you and you don’t follow orders well.” Conveniently, the witness had the day off when I presented that statement as proof of what had happened in my unemployment benefits hearing. I could continue on for pages about how I was treated for standing up to a cop abuser, and what it has cost. I could not go to training at other agencies without people gesturing at me and staring at me. When I got out of that job and applied for other law enforcement jobs, I soon wondered if I had been informally blacklisted despite the official background checks on me being clean. There was no form of legal help at any level who was willing to take on a police department over this treatment. Government agencies wouldn’t help, attorneys wouldn’t listen without down payments, and many people told me to drop it and walk away. I tried to get help from the police chief and new mayor, and everyone else I could think of, but was largely ignored. I was blessed to have a dynamic prosecution team and steadfast police department defending me during the criminal proceedings following my abuser’s arrest, but there was no such protection for my job and reputation. When I had another traumatic law enforcement-related experience years later, I realized that until something blatantly criminal happens, there’s nowhere to go. You have to defend yourself and seek appropriate resources to get yourself back together rather than depending on the system like a “normal” victim. Those things now lie in my past, and I believe in a just God who has seen it all. He said vengeance is His, and He’s a lot bigger and scarier than me. Knowing He’s in control and that He is concerned with my accusers’ lives as much as He is with mine has allowed me to move on. My immediate concern is for the wife of Allen Myron. Is she being believed? Will her concerns be downplayed or minimized in defense of a murderer because he was a cop? Will the fabled “blue curtain” close her off from information that will substantiate her concerns? Is mental health counseling and religious support, if applicable, being provided to her and their children? Or are they being told not to talk to anyone while the investigation is active? Will Myron’s family get good support from his coworkers and the department? Did Myron’s coworkers or superiors see behaviors they should have reported? Was he provided with proper resources, like mental health counseling or psychological screening? Was this agency prepared for the psychological fallout that could happen after recently losing five associated officers, four in the same incident? The Pierce County Sheriff’s Office has already been through hell the past six months and I can’t imagine what they’re going through now. I just hope and pray that the Myron family is being given everything that department can give while this crime is investigated, and that they are not forgotten when it all settles down. Let’s trust that law enforcement employees affected by this tragedy are provided with mandatory, ongoing psychological support. I hope we learn that Pierce County acted swiftly and decisively at the first hint that something was amiss in this deputy’s life. That took amazing resolve for his wife to even approach the department for help. When you report a domestic abuser, you don’t know what they’re going to do to you or your children, or anyone else, when they find out they’re in the hot seat. Authorities also need to realize that the first report of domestic violence is often an exploratory exercise in which a victim only mentions some of what’s going on, just enough to get their attention. Details that could affect the abuser’s job or family’s safety are frequently left out. The victim initially wants to know what help is available and will only reveal the whole story when they’re relatively sure that they can trust the police department they’re talking to. By mentioning my own story as just one example of how police departments mismanage officer-involved domestic violence cases, I hope that policymakers and authorities will realize how important it to have procedures in place for times like these. Officer-involved domestic violence policies should not exclude certain people or allow victims to be harassed or bullied. These policies should provide swift, sure action to prevent tragedies like this as much as possible. Pierce County may have done everything by the book. If they have, then they should be upheld as an example of how to deal with officer-involved domestic violence correctly. I’m not alleging any wrongdoing. It may turn out that Pierce County has no responsibility in this matter. There might not have been any warning signs on their end, although their spokesperson said something about there being a problem with this employee before. It should also be noted that he wasn’t on duty when this happened. Was it preventable? Was Sara Myron treated properly when she came forward? For the record, I am NOT trying to create disruptive conspiracy theories. These are the questions that have to be asked every time an officer-involved domestic violence incident happens. We need to learn what we can from these crimes and do our utmost to keep them from happening again. I really believe that if law enforcement families are provided with proper psychological support and resources, and domestic violence victims in those families know they will be taken seriously when they come forward, we could significantly reduce the incidence of domestic violence among cops. Whatever happened in this case, let’s be honest about it and improve upon it. I guarantee that when this story first went public, there were scores of police officer wives sitting at home praying, “oh dear God, please don’t let this happen to our family.” And if any of those women had decided to seek help from law enforcement, at least a few of them would be guaranteed to be permanently branded as liars, attention whores, deceivers, martyrs, sympathy-seekers, and any other derogatory term that excuses their abuser’s cowardly violence. They would be considered lepers and driven to the fringes of cop society. Do you want to lose your friends? Wind up fighting for custody of your kids? Lose your house? Decimate your life savings and any other financial resources? Relocate to an entirely different area? Have potential partners run away when they find out your “past”? Live in isolation? Miss out on future job opportunities? Have to avoid certain places, even certain cities? Put your life goals and dreams on hold? How about having to arrange your legal affairs so that every last detail of your situation is automatically disseminated to multiple entities if something happens to you? And having to prepare yourself mentally to have absolutely no hesitation to kill someone in self-defense should you ever be forced to defend yourself or your family? You can achieve all of this and more by standing up to domestic violence in law enforcement. It shouldn’t be like this. It’s not fair that some victims are taken seriously and others are automatically derided. Every officer-involved domestic violence incident should be reviewed by a higher authority than the police department where the suspect and/or victim work. Having another agency investigate allegations isn’t good enough. Incidents need to be reviewed outside of police culture to avoid any negative influences. There should be a state-level panel made up of both public and private sector representatives that will review the department’s actions and ensure fair treatment of the victims. Panel members should include domestic violence advocates from nonprofit organizations. A department’s actions should be fully transparent and they should be held accountable if the domestic violence survivors in question are treated any differently than “regular” survivors. In conclusion, and I know I’ve been jumping around, my thoughts and sympathies go out to the Myron family. What mixed emotions and horrors you must all be dealing with as you process the loss of three family members. I hope that you are treated with respect, with dignity, with honor, and with love. You deserve no less from a system sworn to protect you and serve you. Sara, I have the utmost respect for your courage. It could have been difficult to try to get help for your husband. Obviously you had valid reasons to come forward in an effort to find solutions. Whatever the case may be, I admire your strength. I hope you find peace in knowing that you had the resolve to ask for assistance—it shows how deeply you love and care about your family. Jo-Ellen-- You are an amazing and strong woman. Your advocacy and action could be the beginning of major change in Canada. Starting a blog is a great way to get information out. It also opens you up to a lot of criticism and maybe even threats, but is anything truly worth fighting for safe? Safety first, though. It's interesting how some domestic survivors have started blogging about their cases as they happen. If they were to be harmed, the whole world's going to know who has something against them. This isn't always the right thing to do as it can inflame a situation, but I admire the women doing it. You probably already know about this website: http://policedomesticviolence.com/. You may want to talk to the bloggers and organizers there to see if they will feature Canadian news on this subject. Sometimes you can simply email a news link to a site and they will post it. Your post reminded me that what I went through in many ways pales in comparison to the hell other women suffer. I am so sorry for what you've gone through. One thing that always gives me peace, a personal belief, is that everyone will be held accountable for their actions in the end. I believe that is inescapable. Support for this cause is growing, and the grassroots movement of today will become the laws and policies of tomorrow. By speaking out, you are helping others. Every woman's story urges another woman to stand up for this cause. We are tired of being pariahs. I just made it through another horrendous experience with my ex's colleagues. Thankfully, this time many folks witnessed first hand the falsification of information and evidence that has ocurred in my family's matter. This happened on the heels of a news story in which the Chief of the Belleville Police Department in Ontario came forward with the news that she was also a victim of Officer Involved Domestic Violence at the hands of her partner, a retired officer. He (allegedly) broke her arm. Sadly, he was released with a simple "promise to appear"...at least that 's what the papers reported. I am going to be the keynote speaker at an upcoming luncheon with a group of community leaders who are familiar with the work I have been doing in an effort to Criminalize OIDV by ammending the Criminal Code of Canada to recognize OIDV as an entity unto itself, and as an indictable offence. It is my hope that this Cheif will become another voice of hope for all victims of OIDV up here in Canada. As an ex-cop I sure can understand what your writing about. Line cops are typically the only ones that are somewhat ethical....administration is the most unethical group of people I've ever met, and they have endless amounts of power to cover up or alter whatever evidence they want...and no one dare holds them accountable. I am currently in a large federal law suit against the county I use to work for because they altered evidence, covered up two crimes and released their friend and colleague that I had arrested for resisting arrest and assaulting a police officer. He was a long time cop in the same department I was working for and was a drinkin buddy with most of my bosses....he was released on the side of the road, the dash cam was reviewed by the DT Sgt., my boss and several others, I was cleared and told I followed policy and training. I was told I did everything right and couldn't have know the guy, who out weighed me by 100lbs, was not going to hurt me. I was told I was "golden" and released to go back to work. Three days later, when they realized the crimes that were committed I was suspended then let go three days later under the "At Will" law. My immediate boss lied during his interview, the Lt. lied during his interview and the Det. Sgt. that did the "AI" altered evidence to come up with the predeterminded outcome. What they didn't know was that I was keeping all the information that they had altered. I have so much proof that they lied and altered evidence that when we are done certifications will be pulled and people will lose their jobs. Ironically in the 17 months of working with them I had never been reprimended, verbally or written except by the Sheriff who said I wasn't aggressive and tough enough to work in the county. The day before I arreted this guy the Sheriff sent me an email stating "Thanks for taking the time to attend this important event and knowing you I know you represented this office and profession well...Mike" They later said I was a "loose cannon" that couldn't be trusted???? I have reviews, letters of commendation, letters of appreciation from fellow deputies, my bosses and the Sheriff stating the opposite. I was one of their best Deputies and the DA's Office loved me cause my cases were rock solid. Everyone was shocked that I was let go and several long time Deputies are going to testify against the administration in my trial because they are so fed up with the corrupt administration that is not accoutable to anyone. Law enforcement is suppose to UPHOLD the law they are not THE law and all to often that gets lost with those that have to carry their badges in a wheelbarrow cause they are to heavy to have on their chest. In conclusion, what people don't understand is that all the counseling offered out in the world is no good without God....Jesus reprimended the Pharisees for trying to wash the outside of the "bowl" when the inside is what needs to be cleaned. Going to counseling is good but ultimately without Jesus it is only washing the outside of the "bowl". People need Jesus to turn from the ways of this world. Don't let resentment or anger eat you up over this. I know that is something I have to pray about everyday....Jesus is doing as he promised and has allowed the last year and a half to be one of promise instead of destruction....I still don't have a job and have been "blacklisted" as well but there is hope in our eternity. They have none! The good news is that two other officers came to know Christ through this whole event and I am praying for more! The OIDV in my family has escalated again. Another Judge involved with "missing Evidence" & engaging in serious conflict of interest behaviours with no recourse, oversight or remedy in sight. In Canada, we are facing another Federal Election. I wrote our current Prime Minister in the hope of obtaining assistance for Canadian victims of Officer Involved Domestic Violence. I include a transcript of my correspondence. I hope it will shed more light on this international epidemic. I am so sorry to hear that the justice system is not protecting your family. But I admire your strength and tenacity. You never know what nationwide changes could come of your gutsy appeals to your government. 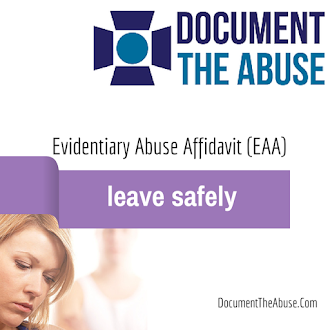 It sounds like you're documenting everything and hopefully you've completed an evidentiary abuse affidavit (search the Time's Up blog for a how-to if you need it). I'm probably preaching to the choir, but you might want to keep copies of all of your documentation off-site too. I hadn't checked these comments in awhile. This same article is posted on my personal blog, and if you post comments there, I'll be notified that you've posted one. If you don't want it publicly posted, just let me know. Prayers and good vibes are going your direction! God knows your situation and He can give you the strength to endure. His light can pierce any darkness. I am touching base to keep you apprised of the progress up here in Canada regarding the issue of Officer Involved Domestic Violence. I provided a detailed radio interview last week regarding my experiences in pursuing assistance and accountability and the efforts being made in pursuit of amending the Criminal Code of Canada and the RCMP Act to formally identify Officer Involved Domestic Violence as an entity unto itself and an indictable offence with mandatory minimum sentencing guidelines for officers and their colleagues within the Justice System found guilty of said offence and other contributory offences. A revised petition is being circulated and will be presented before the House of Commons and the Senate in the near future. Another four women have come forward in the past 8 months self-identifying as victims of sexual assault and sexual harassment at the hands of their colleagues on the RCMP, our national Police Service. Several months ago, an Ontario Judge strongly admonished the assailant officer in my family's matter and advised he would follow up with the Toronto Police Services Professional Standards Unit should the officer continue to engage in behaviours harmful to me. It is my prayer that this Judge will reconsider his decision to hold off until something else happens and approach the involved Service with his evidence and concerns. I want to thank you again for continuing to support this website and a forum for families, victim-colleagues of officers, and other concerned citizens to share their experiences in support of this worthwhile initiative. J Worden R.N. C.P.C. O.P.C. You can see number of how to deal with domestic violence in media. i think one of the main reason behind domestic violence is, trying to control your partner mentally.